Hogan was born almost 190 years ago on 31 October 1828 in Thomondgate, one of six sons of Arthur Hogan and Mary Nolan, and was baptised in Saint Munchin’s Church. Arthur Hogan was a wheelwright in a brewery and a musician, who also made musical instruments, including flutes and fiddles. Michael Hogan was educated at the Christian Brothers School, then in Thomondgate, and was only eight when he wrote his first poem. But the family also suffered hardships during the Great Famine in the 1840s. Hogan first worked in Russell’s Mills, where the clerk, William Doyle, encouraged the young man to develop his passion for writing. While working at the mill he wrote his first epic poem on Kincora and Brian Boru, but he failed to find a publisher and in a fit of rage threw these pages into a fire. However, Hogan’s first poems were eventually published in the Anglo-Celt, then in the Irishman, the Nation, the Munster News, and the Limerick Leader. His first book of poetry, The Light of Munster, was published soon afterwards, but did not sell as well, and Hogan returned to his job at Russell’s Mill. Hogan married Anne Lynch in 1858 in Saint Mary’s Chapel, later replaced by Saint Mary’s Church on Athlunkard Street. The couple moved to Nicholas Street before eventually returning to Saint Mary’s Parish. A later book, Lays and Legends of Thomond, was published in Limerick in 1861, with a larger edition published in Dublin in 1867 and republished in 1880. In his satirical writings, Hogan lampooned prominent figures in city life in Limerick, and caused sensations. Unfortunately, he fell out of favour locally after writing a series of poems attacking some local personalities. Hogan’s gruff demeanour was reflected in his poetry, but his writing made an impact at the time. His best-known epic poem, running to 445 lines, is ‘The Drunken Thady and the Bishop’s Lady,’ which tells the tale of the vengeful wife of the Bishop of Limerick and the night she met the drunk known as Thady. The ‘Bishop’s Lady’ led a life of vice and while alive she roamed the city streets picking fights. After her death, she continued her malicious ways. The ‘Drunken Thady’ was a ne’er-do-well from Thomondgate who would drink himself into a stupor while evading the police. And burned the bed about his mother. One night, while Thady was on his way home, he met the bishop’s wife who intended to take him to hell. She managed to toss him over the Thomond Bridge and he landed in the river. Thady repented and begged God’s forgiveness, vowing to live peacefully if his life was spared. His life was spared – Thady was no longer the Drunken Thady. Hogan emigrated to the US in 1886, but he returned to Limerick three years later. He died at 8 Rutland Street in 1899 and was buried in Mount Saint Lawrence Cemetery, Limerick. The ‘Friends of the Bard’ was founded in 1992 and through the work of this society a new memorial was placed over Hogan’s grave, which included his face in relief. The ‘Friends of the Bard’ erected the life-size statue of Hogan on the plaza outside King John’s Castle in 2005, close to the former Bishop’s Palace. The Autumn colours are to be seen all around me this week. The green and golden field beside the Rectory in Askeaton show the signs of a second cutting of grass this autumn, the blackberries are ripening in clusters on the brambles against the walls behind the Rectory garden, and there is a last burst of red autumn roses outside the rectory kitchen. 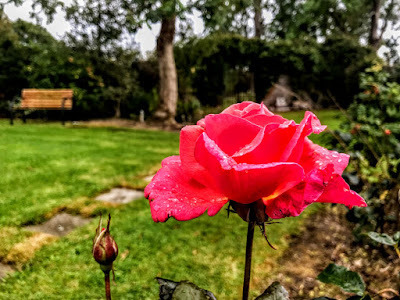 There was a time when I felt morose about autumn, the loss of summer sunshine and the impending arrival of winter, with its late mornings, early evenings, the cold, the frost and the snow. I need direct sunlight, and often work at the kitchen or dining room table, looking out onto the rectory garden, and for these past few days the rectory garden has been filled with the hues of autumn leaves, so that I know now that the colours of autumn have their own beauty. The song ‘Autumn Leaves’ was originally written in 1945 as the French song ‘Les Feuilles mortes’ (‘The Dead Leaves’), with music by the Hungarian-French composer Joseph Kosma and lyrics by the French poet Jacques Prévert that evoke images of the dead leaves falling in autumn. The Italian-born French singer Yves Montand introduced the song ‘Les Feuilles Mortes,’ with its heart-breaking lyrics in Marcel Carné’s film Les Portes De La Nuit (1946), a gloomy urban drama set in Paris in the immediate aftermath of World War II. The film was a commercial failure, but it was one of the many films that inspired French ‘poetic realism,’ a genre that in turn inspired the American film noir movement. The American songwriter Johnny Mercer wrote English lyrics for the tune in 1949, changing the original French title to ‘Autumn Leaves.’ Mercer’s words are not a translation of Prévert’s poem, but he uses a similar image of dead leaves to describe memories of love. This song was first recorded by Jo Stafford, and Édith Piaf sang ‘Les Feuilles Mortes’ with an English verse in 1950 on The Big Show. Later versions were recorded by Bing Crosby, Artie Shaw and Paul Weston. Mercer’s song became a hit for Nat King Cole in 1956, and inspired the title of the film Autumn Leaves (1956), starring Joan Crawford and Cliff Robertson. The film tells the story of a woman who marries a younger man with psychiatric problems brought on by his former wife’s affair with his father. However, the title Autumn Leaves has no apparent connection with the storyline, other than sharing a vague melancholic tone. The film’s original title was The Way We Are, but this was changed to Autumn Leaves to capitalise on the success of the song ‘Autumn Leaves,’ which Nat King Cole sings over the film’s title sequence. The song ‘Feuilles Mortes’ was also referred to by Ian Fleming that year in his James Bond novel Diamonds are Forever (1956). The song has been a favourite among jazz musicians, including Miles Davis, and has been recorded by many artists, including Bob Dylan, Eric Clapton and – most poignantly, shortly before her death – Eva Cassidy. The lyrics by Prévert (‘the north wind takes them / into the cold night of oblivion’) and Mercer (and ‘soon I’ll hear old winter’s song’) stoically accept the end of love, the end of autumn, and the end of life. But, while Autumn may turn to Winter in the weeks to come, winter brings its own beauty and blessings, and it is followed by the sunshine of spring and summer. I went for a walk through the fields beside the rectory to take in those autumn colours yesterday. 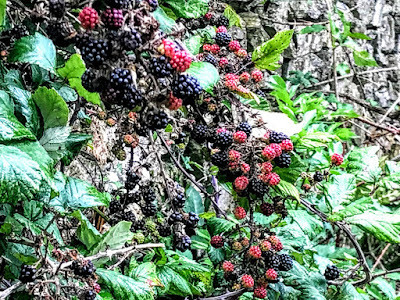 Meanwhile, the blackberries are ripening along the garden wall and must be picked before Saturday, Saint Michael’s Day [29 September], according to Irish tradition. 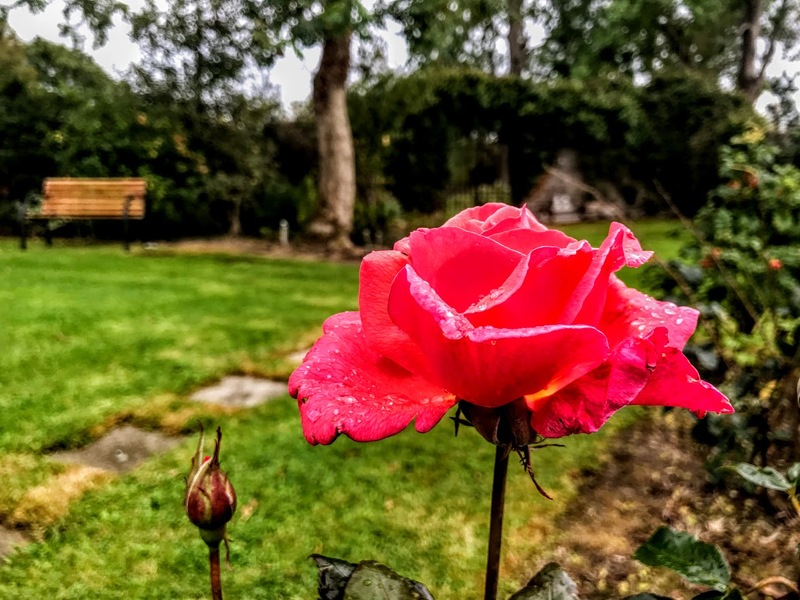 The red leaves are already beginning to fall from the autumn roses, meaning the dead heads need to be trimmed soon so the spring roses can grow fully.